COMMENT | The danger of choosing relatives of an iconic leader to deputise for him when he faces legal trammels imposed by the powers that be is that the surrogates are soon apt to think they are where they are by merit rather than presumption. This is the situation of Dr Wan Azizah Wan Ismail, the PKR leader who has just added petulance to a lengthening list of her demerits, both as party leader and as deputy prime minister. “Is there a problem? I thought we were voted by the rakyat (people),” was Wan Azizah's disingenuous reply when questioned by reporters on the possibility of the public perceiving the presence in Parliament of her, daughter Nurul Izzah and - should he win in Port Dickson - husband Anwar Ibrahim as rank nepotism. A perception of nepotism would still be justified even if the reformasi movement, triggered by Anwar's travails 20 years ago, had not had as its rallying cry the demand to end the corruption, cronyism and nepotism then plaguing the nation from Umno-BN's misrule. Because the movement had made it its clarion call to combat these three scourges of the polity, it is incumbent upon the Pied Piper of the movement (Anwar) and the one who deputised as leader while Anwar was in prison to see to it that such faults as the reformasi movement decried then are not replicated now, when the reform-seekers have become the government. That's not all the perceptual burden that has to be avoided. As recently as last year, in an interview with Al Jazeera, Wan Azizah had described her part as that of a “seat warmer”. Clearly, she meant that her withdrawal from the political arena would follow upon the release of Anwar from jail and his return to the legislative fray. 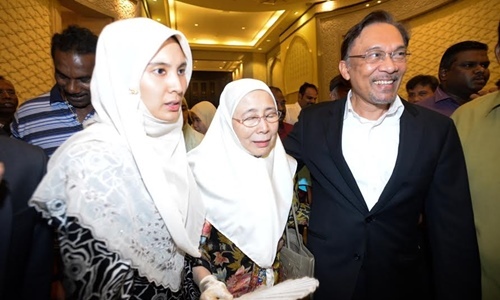 A royal pardon for Anwar in May removed one hindrance to his return; his election unopposed to the PKR top post last month has taken care of the other.